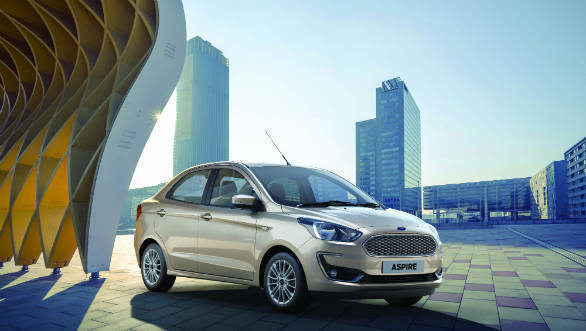 Bookings for the facelifted Ford Aspire compact sedan have begun in India ahead of the new sub-four meter sedan's launch on October 4. 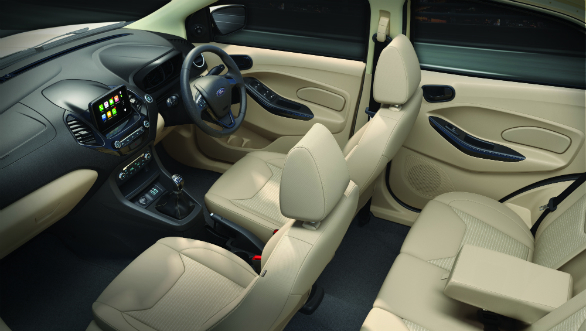 Buyers can book the new car at any Ford dealership after paying a booking amount of Rs 11,000. The facelifted car will get a number of changes. These are a new bumper with silver inserts similar to the black ones on the new Freestyle, a redesigned headlamp cluster, new fog lamp housings and a larger front grille finished in silver. Changes to the rear are limited to new inserts in the rear bumper and a subtle black lip at the bottom to break the visual bulk of the rear end. A new alloy wheel design will also be available on the top-spec Titanium trim seen in these pictures. The interior will get a new two-tone black and beige colour scheme. Most notably, this facelift will see the addition of ford's Sync3 infotainment system via a new floating touchscreen in the centre console. Repositioned air vents and piano-black accents complete the changes to the interior. The biggest change mechanically is the addition of the 1.2-litre Dragon motor seen on the Freestyle, which makes 96PS/120Nm. The diesel variant will continue to be offered the 1.5-litre 100PS/215Nm motor. The Figo/Aspire twins have not been the most successful for Ford. this update should bring them closer to rivals like the recently launched Honda Amaze, in terms of features and styling. Tags: 2018 Ford Aspire facelift bookings | 2018 Ford Aspire facelift bookings open | 2018 Ford Aspire facelift booking amount | 2018 Ford Aspire | 2018 Ford Aspire facelift debut | 2018 Ford Aspire facelift unveil | 2018 Ford Aspire facelift India launch | 2018 Ford Aspire facelift details | 2018 Ford Aspire facelift new features | 2018 Ford Aspire facelift India launch date | 2018 Ford Aspire facelift safety features | 2018 Ford Aspire facelift images | 2018 Ford Aspire facelift spied | 2018 Ford Aspire facelift spy shots | 2018 Ford Aspire facelift exterior | 2018 Ford Aspire facelift design | 2018 Ford Aspire facelift interiors | 2018 Ford Aspire facelift engine | 2018 Ford Aspire facelift petrol engine | 2018 Ford Aspire facelift variant changes | 2018 Ford Aspire facelift India | Hyundai Elantra | 2018 Ford Aspire facelift | 2018 Ford Aspire facelift rivals | 2018 | Ford India | New Ford Cars | Upcoming ford cars | latest Ford sedan | new Ford sedan | upcoming Hyundai sedan | 2018 Ford Aspire facelift new images | 2018 Ford Aspire facelift spotted undisguised | Ford Freestyle | Ford 1.2 litre Dragon petrol | New cars 2018 | new car launches in India | new sub four metre sedan.